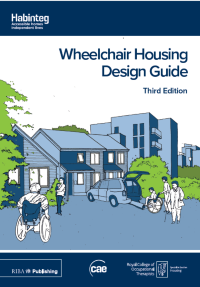 The third edition of Habinteg’s Wheelchair Housing Design Guide is published this week. The guide is the product of a partnership between Habinteg and the Royal College of Occupational Therapists Specialist Section – Housing (RCOTSS-Housing) and is published by respected architectural content experts, RIBA. Amongst a range of strong recommendations, the report calls for all new homes to be built to The Building Regulations Part M (4) Category 2 – an accessible, adaptable standard.